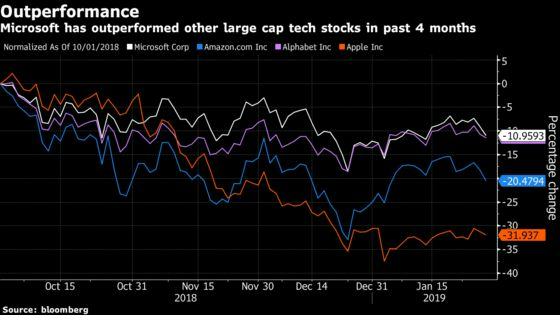 (Bloomberg) -- For the past few months, Microsoft Corp.’s stock has performed better than its tech-giant peers as investors bet its enterprise and cloud-focusing business offered a safe port amid weakening spending in the sector. Now it’s time to test that thesis. Commentary from chipmakers Intel Corp. and Nvidia Corp. “raises the question of whether this is due to hyperscale vendors having sufficiently built out last year to sustain expected growth (which would be a good thing for Microsoft), or whether there could be unanticipated slowing in cloud demand,” Raymond James analyst Michael Turits wrote. Networking gear vendor Juniper Networks Inc. also reported weakness from cloud customers. Microsoft carries added heft this earnings season after surpassing Apple Inc. and Amazon.com Inc. as the world’s most valuable company. The Redmond, Washington-based company has a market value of more than $800 billion and outperformed most other large-cap technology companies over the past four months as investors bet that spending by business customers will hold up better than consumers. Microsoft rose 1.7 percent at 10:08 a.m. in New York, snapping a two-day skid amid a broad rally in tech stocks. Wall Street is projecting revenue of $32.5 billion in the company’s fiscal second quarter, up 12 percent from the same period a year ago, according to the average of analyst estimates compiled by Bloomberg. Bank of America Merrill Lynch expects Microsoft’s sales to exceed the estimate driven by strength in the company’s More Personal Computing segment, which includes gaming and advertising, and its cloud business.